The trust said it wants a "corporate image"
Doctors, nurses and health visitors in Lancashire could be banned from wearing novelty socks to work. The proposed ban is part of a uniform policy which would also stop staff from having tight clothes, unusual hairstyles or excessive tattoos. The East Lancashire Hospitals NHS Trust said it wanted a "corporate image which presents a professional and business-like approach". But a Conservative MP has labelled the policy "completely daft". Lynn Wissett, director of clinical care, said: "Many of our staff work with very sick or dying patients and the policy is intended to make sure that our staff present a professional image at all times. "Our staff and members of the public have told us is that we need to spell out clearly what is and isn't acceptable in relation to personal appearance, dress, grooming and hygiene." Ms Wissett added that the trust would adopt a "common sense" approach to such issues. The board met to discuss the issue on Wednesday but Nigel Evans, Conservative MP for the Ribble Valley, said the policy "should not be a priority for the NHS". 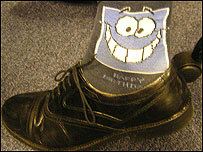 "I would have said that in children's wards it would be compulsory to wear silly socks," he said. "I think people would prefer to see happy doctors and nurses - it's dictatorial and it's over the top. "It's completely daft, this cannot be a priority for the NHS."